Tags: Antique Print, Asia, Indonesia, Tidore. View of Dutch vessels stationed in bay of Tidore. Dutch attack on the Portugese. The first Portuguese expedition to the Moluccas under the command of António de Abreu arrived in Amboina and on the Banda islands in 1512. From 1513 the Portuguese sent an annual trading fleet to the Spice Islands. 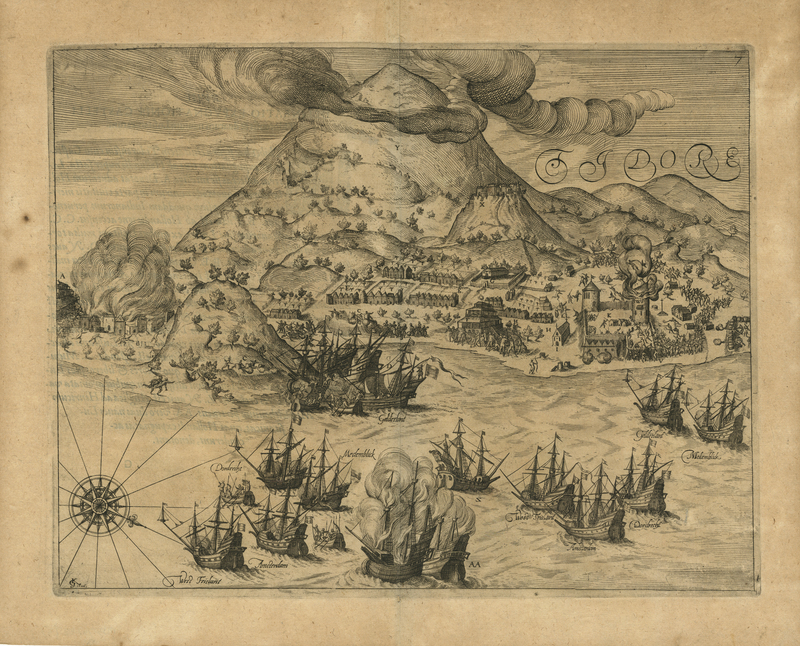 The first under Captain António de Miranda de Azevedo opened two small “feitorias”, one in Ternate and one in Batjan. The Dutch–Portuguese War was an armed conflict involving Dutch forces, in the form of the Dutch East India Company and the Dutch West India Company, against the Portuguese Empire. Beginning in 1602, the conflict primarily involved the Dutch companies invading Portuguese colonies in the Americas, Africa, India and the Far East. The war can be thought of as an extension of the Eighty Years’ War being fought in Europe at the time between Spain and the Netherlands, as Portugal was in a dynastic union with the Spanish Crown after the War of the Portuguese Succession, for most of the conflict. However, the conflict had little to do with the war in Europe and served mainly as a way for the Dutch to gain an overseas empire and control trade at the cost of the Portuguese. English forces also assisted the Dutch at certain points in the war (though in later decades, English and Dutch would become fierce rivals). The result of the war was that Portugal won in South America (Dutch Brazil) and Africa with the Recapture of Angola, and the Dutch were the victors in the Far East and South Asia. English ambitions also greatly benefited from the long-standing war between its two main rivals in the Far East. Measures: 263 x 335 mm.